How basic is too basic? I would say too basic isn't even a thing, but sometimes (like right now) I sew something (in this case things), and wonder if they are just too simple to justify photographs, or your attention. I like to document my making, but what is there to say about garments this simple? I'm not one to fuss with a fitted bodice, I haven't installed a zipper in years, and rarely even sew a dart. I made my last party dress in a year with 2 zeros. My outfits are plain, but I think my wardrobe taken as a whole has something (all be it very simple) to say. These humble garments won't stop traffic, their true value is in their usefulness as a group that reflects my lifestyle and aesthetic. So far my Summer of Basics line up includes: 1 Adventure Tank from Fancy Tiger Crafts, and 2 self-drafted shorts. 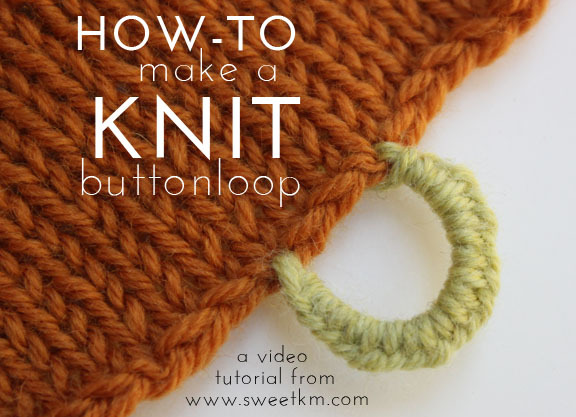 I say so far because I've got a summer sweater on the needles that is perfect for the green shorts, but I've also got a pretty full schedule and I'm going to cut myself some slack. 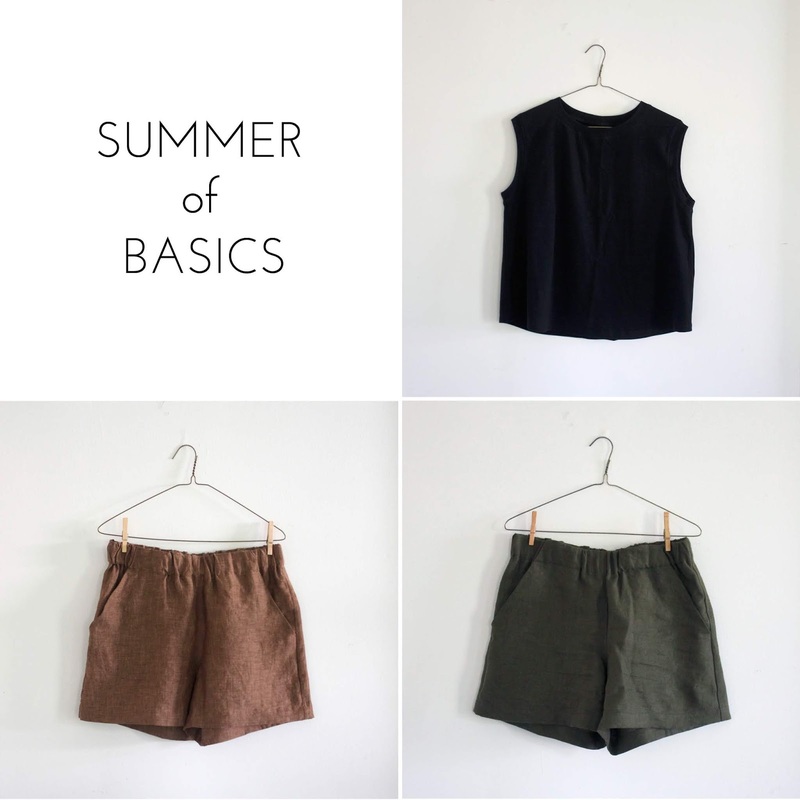 We'll call the brown shorts a #summerofbasics alternate if I make my sweater deadline. Let's talk about shorts for a minute. I hate shorts. Hate them. I very rarely wear them, and only in the confines of my own yard and garden. I hate how they pull at the hips and gap at the waist. I hate the way they ride up when I walk. I hate all the tugging and adjusting shorts require. Thing is, I don't really hate shorts. I hate ill fitting, ready to wear shorts designed for a totem pole, not a real person with any differentiation of silhouette. I know ill fitting, ready to wear shorts fit some body, but they don't fit my body. So, I avoid them at all costs. Like shift dresses, it took me a while to remember that the shorts are not the problem, the fit is. I can sew. I can make anything fit. 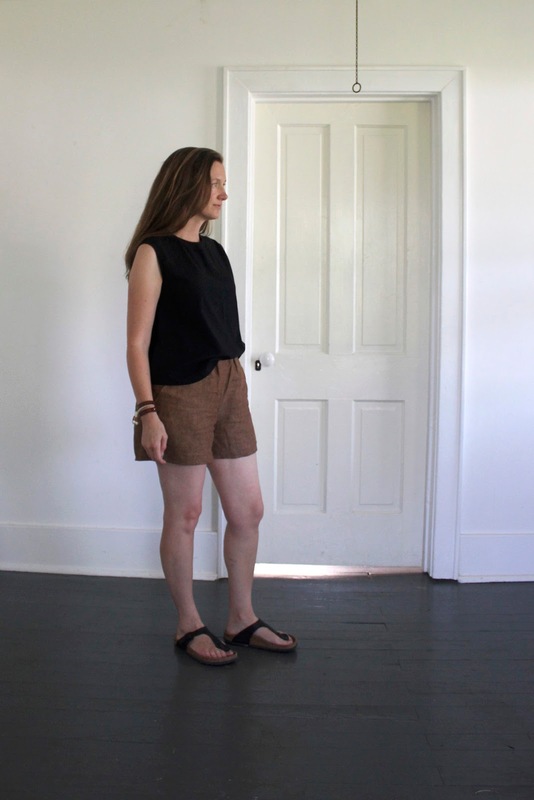 Both brown and green shorts are from the same self-drafted pattern. This design started as my signature wide leg pants that I love (some days) even more than my own children. I cropped and widened the pants design at the leg opening to make shorts that fit like a glove. Summer is a tricky season for making time to sew. Confronted with one family fun deadline after another I stretch the making day the only way I can - well into the night. 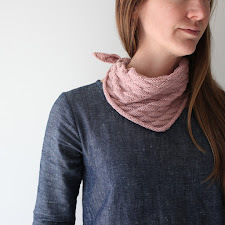 One night just before a family trip to my parents' farm (where we spend most of the summer), I allowed my self a rare cup of afternoon coffee and made a solemn vow not to sleep until I had crossed three things off of my must-sew list. It was a bit extreme (even for me), as I was up until 4am, but the ease with which I've been packing for summer trips makes the late night worth it. 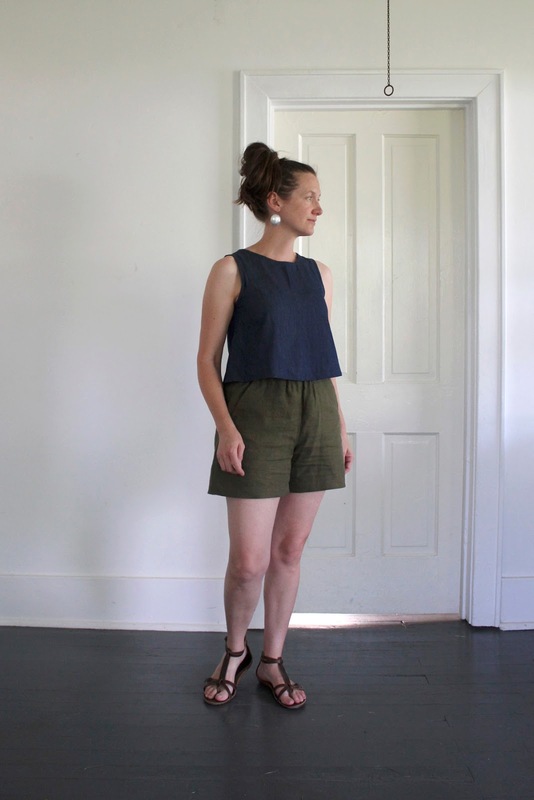 Basic garments are my very favorite kind to sew, and these shorts blend perfectly with long past makes like this Dress No. 1 cropped into a top, and the Adventure Tank that is fresh off the ball point needle. The Adventure Tank from Fancy Tiger Crafts is my new favorite summer tee. I knew it would be when it first came out, but I dithered before buying it because I thought I should try to draft my own. I could, it's simple, but it's simpler to just buy a well drafted pattern and eliminate all the variables. For the tank I used a nice quality Kaufman Laguna Jersey Knit from Fabric.com*. It's great for this design, and any basic tee. 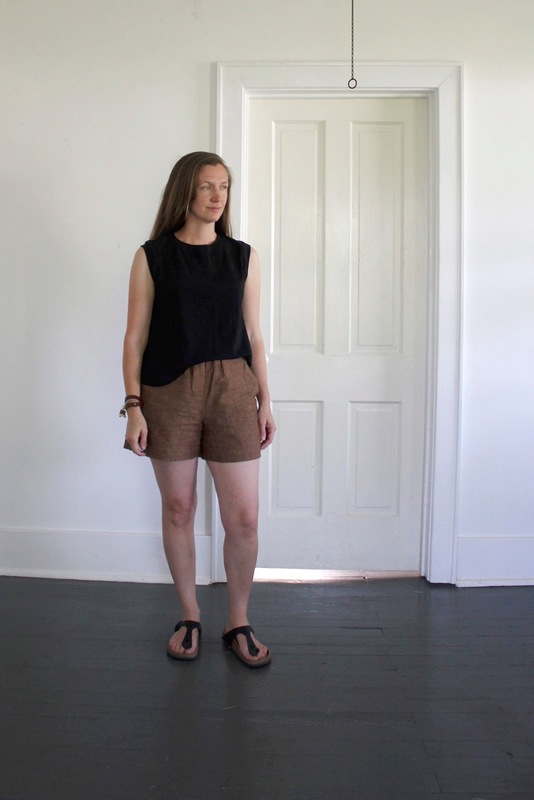 The brown shorts are my go-to Slub Linen from Joann Fabrics in Tobacco Potting. 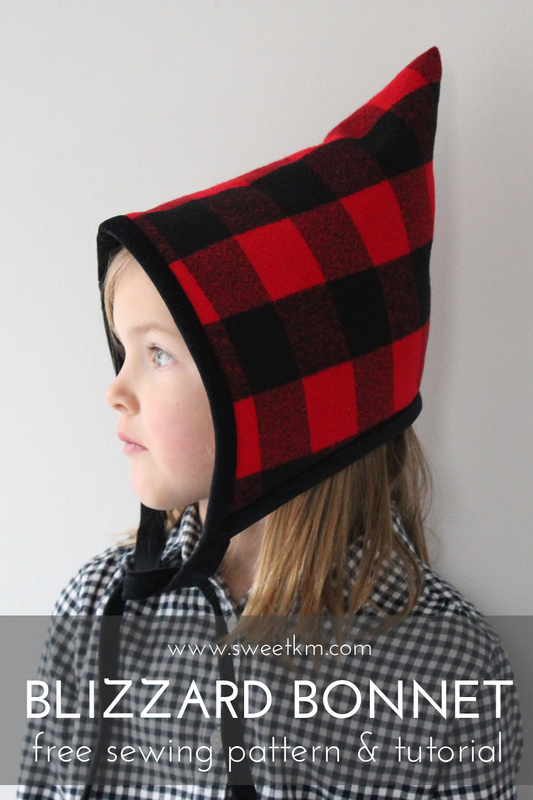 It's light weight, easy to sew, washes well, and I can pick it up on a whim. At this point I have a dress, pants, and shorts in this fabric all in heavy rotation. 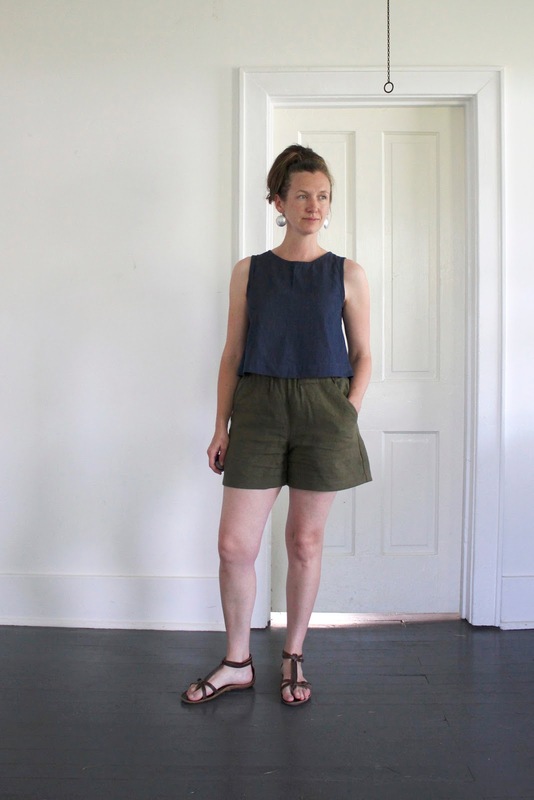 The green shorts are washed linen from Fabric.com. This is a medium weight 100% linen. 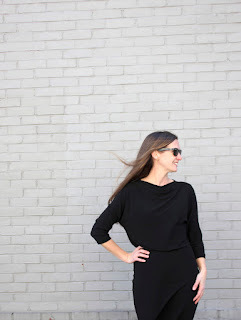 I love the weight and quality of this fabric, it's completely opaque and easy to sew. Next time I would make the inside of the waistband with a lighter weight fabric to reduce bulk around the elastic. This fabric would be great for Persephone Pants or Lander Pants. I bought the Persephone pattern when it came out. Time to stop planning and start sewing. * As usual, Fabric.com links are affiliate links all fabrics were purchased, all opinions are my own. Love these makes and I am totally behind staying up until 4 am to make a wonderful basic that will last years and years. As a mom of three I often find myself filling my soul up with quiet evenings (nights?) of making. Thank you for continuing to share your makes, they are so inspiring! Love a fellow neutral, natural fabric, classic shape lover. Thanks Kate! You've summed me up perfectly. :) I think burning the midnight oil is a common way for mom's to find time for themselves. 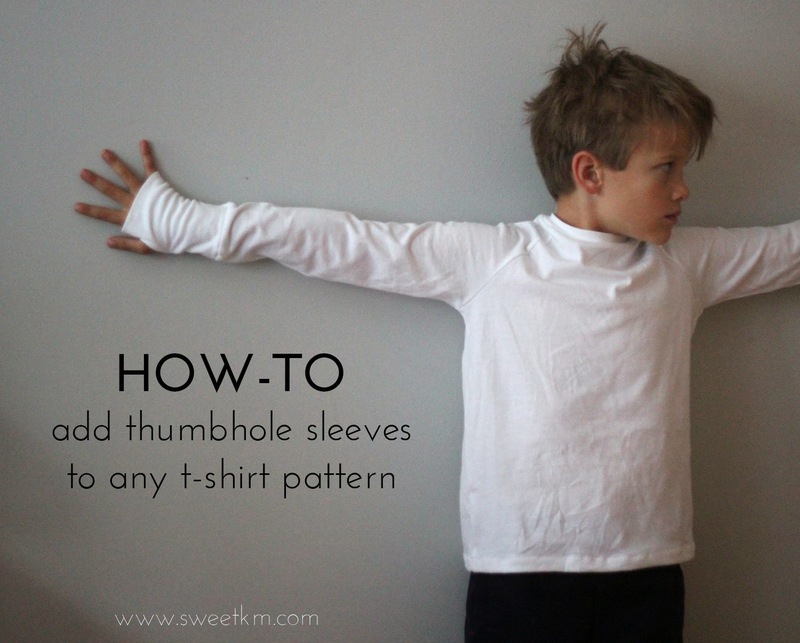 I even remember my mom doing it when we were little. Oh, you must take the FIT class! I dream of doing that, but don't want to commute (although I've considered trying to do it from Philly) or the out of state tuition. And, thanks for the kind words! Love all of this, the colours, the simplicity and the way it was accomplished. Perfect!! So, your post and the fabric recommendations are much appreciated! I make a lot of fabric choices based on what other people have used, thought I'd share the info. Online fabric shopping can be so tricky! I agree! I often buy the same fabric other's have used. I would definitely all three of these fabrics again!